iClicker can be used to allow students to answer questions with their laptop computers or other mobile devices. 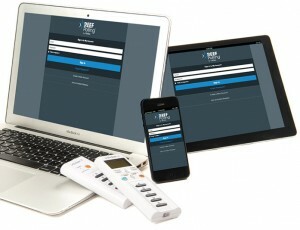 Formerly named i>clicker GO, REEF Polling voting can be done using a Web browser or an app for iOS or Android phones. NOTE for those instructors who had previously used the REEF Polling Instructor program: Due to numerous issues, the REEF Polling instructor program will not be encouraged for future use and the iClicker 7 instructor software will be used instead. The instructor’s iClicker 7 software will collect votes from both iClicker remotes and REEF (mobile/web) Polling responses. An Internet connection in the classroom (wireless or wired) is required for both instructors and students to allow REEF Polling. Please note that SMS text responses (texting) are not supported with REEF Polling for any response type; only web-enabled devices such as smart phones, iPads, tablets, and laptops can use REEF Polling. Students who do not own or have access to a web-enabled device during class time can still participate in classroom polls by purchasing an iClicker remote through the Cornell Store, but these students will not be able to respond to short-answer questions which require alpha-numeric character input. Instructors request the Classroom Polling service by filling out the form. You will be contacted by one of the Academic Technologies staff to meet. If allowing students to use the REEF Polling mobile app, wireless network capabilities in your class room for a number of students must be confirmed first. Please contact the support staff for your class room. If you do not know who that person is, please contact us at acadtech@cornell.edu and we will work with the class room support staff to determine if the room is able to handle the number of wireless connections for your class. You can ask multiple-choice questions as well as short-answer questions for REEF Polling participants with up to 140 alpha-numeric characters for responses. Web-enabled devices are required for short-answer responses. For ideas on how to use in-class polling, see our pages here. Purchase a REEF Polling subscription online at: app.reef-education.com or download the app from the Apple Store (iOS) or Google Play Store (Android) on your smart phone or device. The app is free but a subscription is required to use it in class. For the Cornell NetID field, you MUST use your Cornell NetID (such as ewe2). Do not use your Cornell Student ID or an email address. For those in classes using Blackboard: If you have connected your REEF Polling registration to your course, you are all set. Your instructor may still choose not to display your polling points in Blackboard – this is the discretion of the instructor. Please do not register iClickers at the iclicker.com site. YOU DO NOT NEED TO CREATE A REEF POLLING ACCOUNT in order to receive points for responding with your iClicker remote. You do not need to purchase REEF Polling account. For those in classes using Blackboard: You must register your clicker in Blackboard to receive credit for your clicker responses. Please follow these steps to register your clicker in Blackboard. Your instructor may still choose not to display your polling points in Blackboard – this is the discretion of the instructor. You have successfully registered your i>clicker with the Cornell i>clicker system.